The pension was located close to several local attractions--a magnificent observation tower shaped like an egg in the middle of the Bavarian forests, several living museums, and a glass factory. Local gasthauses provided excellent local dishes. A very relaxing alpine atmosphere. Where to find Kellberg hotels near an airport? Where can I find hotels in Kellberg that are near tourist attractions? Arranging time in Lower Bavaria and would like to stay in Kellberg? Within a 0.1-kilometre (0.06-mile) distance of the downtown area, you'll find 5 Expedia-listed hotels and apartments. Although Kellberg can't boast to having a huge array of accommodations right near the heart of the town center, Hotel Lindenhof is handy enough to satisfy most visitors. You could investigate the Das Wunsch-Hotel Mürz and the Forstinger Hotel. 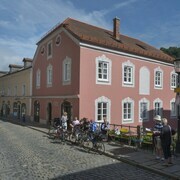 The Das Wunsch-Hotel Mürz can be found 30 kilometres (20 miles) from downtown Kellberg. The Forstinger Hotel, is situated 17 kilometres (11 miles) away. 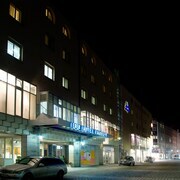 More alternatives around this area are the AKZENT Hotel Antoniushof and the IBB Hotel Passau City Centre. Looking for more to do? Spend the day visiting Stadtturm and St. Peter's Church, in Straubing, 80 kilometres (49 miles) to the northwest of Kellberg. 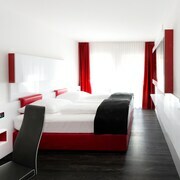 Expedia-listed Straubing hotels and accommodations include the Hotel Theresientor and Hotel ASAM. 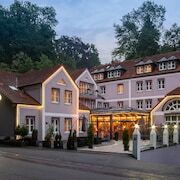 Or, you could consider staying in Bad Birnbach, 40 kilometres (24 miles) to the southwest of Kellberg, where you can pick from the Vitalhotel Bad Birnbach and Hotel Chrysantihof. Whether you're just passing through or staying in Bad Birnbach, set aside some time to visit the Rottal Thermal Bath and Golfpark Bella Vista. Make sure you don't leave Lower Bavaria before catching a game at Sport EDER + BERGER. 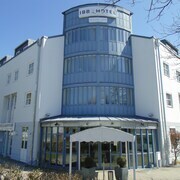 If you are after somewhere to stay book a room at the Apparthotel Alte Innbruecke. Now you've checked out hotels and apartments options in Kellberg, make sure you check out our Kellberg travel guide for the inside scoop on the many scenic and cultural attractions in this area. What are the most popular Kellberg hotels? 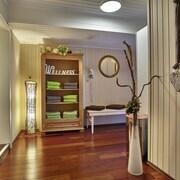 Are there hotels in other cities near Kellberg? What other types of accommodations are available in Kellberg? Explore Kellberg with Expedia.ca’s Travel Guides to find the best flights, cars, holiday packages and more!